Don't know the meaning of a word on a web-page or wanna know more about it. 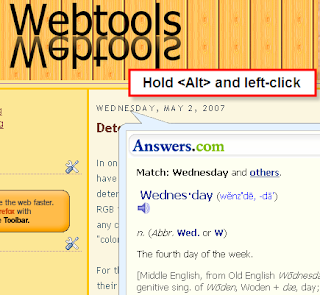 Forget using dictionary, now online help is available within your Firefox browser. Just go to Mozilla Add-on page and download the extremely useful Answers add-on. After installation, for knowing the meaning of any word or query, just hold the key and left-click. A pop-up window will appear along with your answer, which gives brief introduction of the word. If you wanted to know more, just click the button provided for the same on the pop-up window and it will give you reliable facts and definitions from over 100 dictionaries, encyclopedias and almanacs without having to search through lists of search engine links. Not yet convinced?..........Why not check it out here at Mozilla Firefox blog itself.